Caturday#Caturday Small Rabbit Or Large Rat? #Caturday Small Rabbit Or Large Rat? We’ve been invaded. While Mom was out, somebody brought this creature to our house. Charlie let them in. 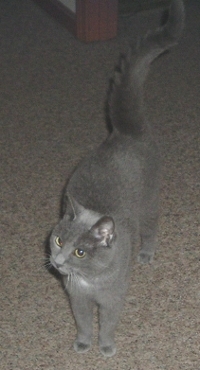 Maybe he thought it was me, because we do have the same fur: mostly silver, with a little white underneath. I was shocked at Charlie allowing it. But when Mom got home, she explained that my youngest sister, #4 Daughter, had this thing as a pet and needed us to look after it for a week while she’s away. 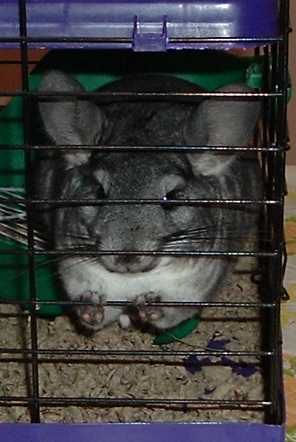 Mom says it’s called a chinchilla, and I laughed. I mean, that isn’t a real word, is it? Mom makes up words all the time, but that’s the silliest one yet! ha ha! But we don’t look alike, this thing and I, really. Look at the picture of me to the left, and then look at the creature below. Evil looking, isn’t it? Her name is Dasha. She’s from the Andes — or that’s her ethnic origin, anyway — so she needs the temperature to be 70F or lower. So Charlie put her on a table in his office and installed a window air conditioner to keep that one room colder than the rest of the house. CHARLIE! He won’t even let me sit in his chair, and he’s turned his office into a refrigerator for this thing! And he and Mom take turns sleeping on the couch up there so they can make sure the air conditioner doesn’t freeze up or go out! Charlie won’t even clean my litter box! And look at this! This is twenty bucks’ worth of stuff Mom bought for the thing, not to mention the packing box she went out and bought, so Dasha would have some place outside the cage to play. Maybe I would like a nice big box to play in. I can just imagine what Charlie would say if Mom put a big cardboard box in his office for me! But Mom says Dasha is just visiting, and they need to make her feel welcome. It’s only a week, so I suppose I can tolerate it. Fortunately, Mom’s friend Marie Britt chose this week to make me three stuffed meeces to play with, although the Hello Kitty one somehow mysteriously disappeared and ended up on Mom’s Hello Kitty shelf. I’ll be glad when it goes home, though. Chinchillas can’t be wet, so they take “baths” by rolling around in volcanic ash; between the ash and the cold, Mom is all stuffed up and I hate to see her snuffy like that. I’d better give her some head butts and claw pricks to make her feel better. Love you, Mom! A WRITING PROMPT FOR CATS: Your person brings in another animal, not a cat or a fish. This entry was posted in Caturday. 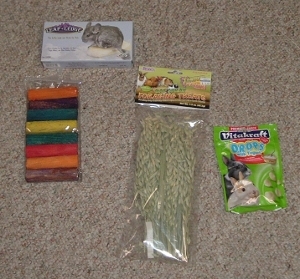 Tagged cats, chinchillas, pets, spoiling the grandkids. What a load of trouble! Buck up, Katya. Your Mom loves you best. You tell ‘er, Jane! I sure DO love Katya best. Cats for me! Cat looks cute. Reminds me of my beloved and lost Sweedie who looked just the same. Bear with the rabbit, my feline friend. I had a rabbit for a few weeks as a kid, until a disaster happened. They are not so bad as visitors. Pete, I had a rabbit as a kid, until disaster struck! Are you sure we aren’t the same person? A neighbor’s dog came over and BIT THE FEET OFF MY RABBIT IN THE NIGHT! Trauma? Oh, dear God, I still won’t sleep with my feet or hands hanging off the bed. True fact. Mine was much worse, at least for me. Jackie the Jackrabbit lived in a nice cage, in the back yard, in the shade of the fig tree. The cage was on a little hill, about 1.5 feet high. But in Phoenix we had irrigation for the yard. The times cycled, sometimes morning, sometimes noon, sometimes evening, sometimes in the night. Our day, this time, was Friday night, around 4 AM. My dad had come home from a hard week’s work in Benson, and was exhausted. He just did not pay close enough attention. He obviously thought Jackie was safe. But the water pressure was very strong, and the water rose much higher than usual. The little hill eroded away. The cage sank. Poor Jackie was asleep. And he had no place to go. Dad never noticed. If he had, he would have acted. Dad found Jackie drowned in the morning. He was very sad, and came and told me. We gathered together for a funeral that evening, under the shade of the fig tree. I was too upset for another rabbit. We gave the cage away. I was about 10 or so. And at 57, I still remember…..
Marian Allen would love to share..Are You Ready For #Free #Ebooks July 16-17? Sigh. Well, it was years ago. It was a freak high water incident. It could have been worse, as our house nearly flooded, too! One hopes, Jackie is “in a better place”. The sad thing is, he would have been returned to the wild in a few days. That does make it sadder. 🙁 There’s at least part of a story there, somewhere. I can’t believe I said that. Writers are such ghouls! Not really like a cat or a rat… although it does look a little like a rat that swallowed a cat? Stay wary Katya!